Today Google Streetview arrived in the UK. Now you can explore maps as if you were walking or driving down them, at least for he major cities and major streets in those cities. 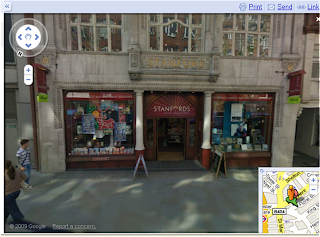 You can't see my office, because presumably Parker Street WC2 was too difficult to get down (or blocked - there was building work going on last summer when they were taking the pictures), so here's a shot of the map shop Stanfords, in Long Acre. It seemed appropriate, what with Sergey and Larry having met at Stanford University, and it being a map shop. Also: Nick Burcher has re-created a couple of album covers and been looking for street art over at his blog. oooh good spot, hadn't seen that. my house is on it but my work isn't. that's weird! I've asked Google to remove my house - let's see if they play ball. Let's all gang together and stop this nonsense.